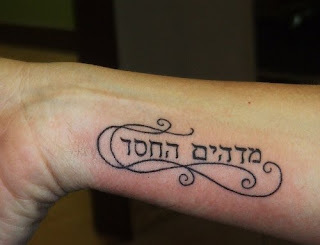 The classic mistake in the art of Hebrew tattoo: it's written backwards. Yep. instead of saying "Kelly" as the girl no doubt intended, this colorful cutie says "Yelk". 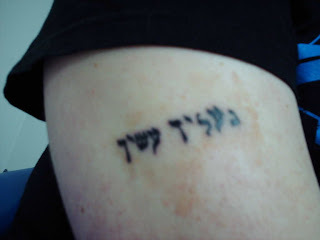 Tattoo wannagets, do remember, Hebrew is written from right to left. 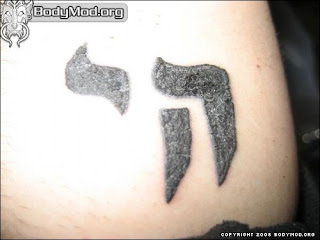 There are many Hebrew tattoos that simply say "Hi". Now the next image is how a "Chai" is actually supposed to look. 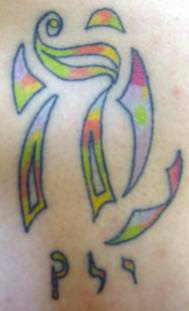 See how the "Chet", the letter on the right is all connected? When you leave a gap, you get a completely different letter "He". 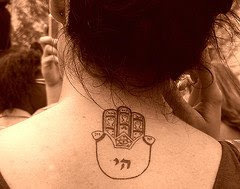 Of course, if those girls just went for a piece of Chai Jewelry instead of a tattoo, mistakes and permanency would not have been an issue.